Bee Bearding, doesn't this man look happy to be doing it? How does it work you ask? You take the queen bee and attach her to your body, (your chin in this case,) and wait for the girls to "come to mama". In theory, the wearer does not get stung, because the girls are not protecting their territory, as they do while in or near the hive. 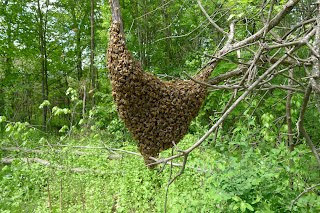 Here you can see the bees forming a natural beard as a swarm. Sara Mapelli prefers to dance with the bees. A very elegant dance, ending with a tea party. I cannot tell if her bee stung lip is indeed a bee stung lip. This dance was featured in an amazing documentary about bees called "Queen of the Sun". Wang Dalin wanted to wear as many bees as possible. 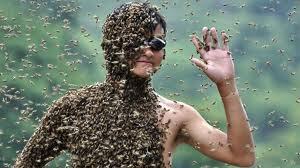 So many that he won an award in 2011 for attracting 26.86 kg of bees in 60 minutes. Here he is at the weigh in. 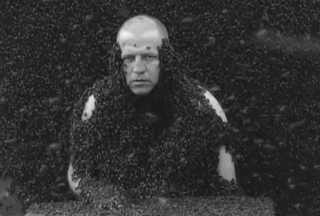 Jeroen Eisinga decided to make an art piece out of bee wearing. He doesn't look to happy about it though. 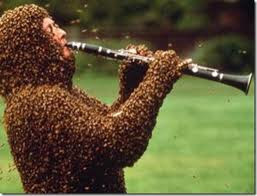 And this fellow decided to take his bees to a clarinet lesson. Sharing my experiences as a beekeeper.